The family's story as narrated by Mia Maroto. I met my husband Ivan in the Spring of 2003. He is a perfect gentleman, and one of the best things I love about him is that he a Christian and a hard worker. We went to church together on Sundays, and he was always interested in learning new things about the Lord. Ivan seemed to be the perfect man for me but had one flaw: He was not an American citizen and had entered the country illegally. I accepted that fact, feeling that Ivan was and is one of God's citizens in His kingdom. My parents also love Ivan but were terrified that he might eventually be deported. Ivan and I married almost five years ago in a little church. We tried every immigration attorney in Dayton to see how we could fix his immigration status but they all said that he had to wait for some new immigration laws to be passed; there was simply no way to change his undocumented status. 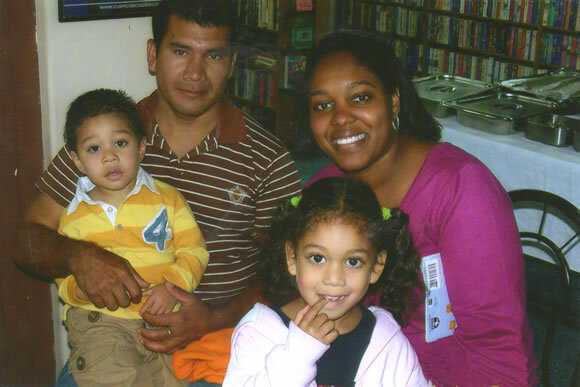 Our four-year old daughter Juliana has brought so much joy to our family as has our almost three-year old son, Juan. In April 2007, Ivan was apprehended along with his co-worker, who was driving without a license. When they couldn't verify that they were in the country legally, they were jailed and turned over to the immigration authority. I was left without my wonderful husband and with two very small children. I decided to return to Ecuador in order to keep our family together. My entire family, including parents and siblings, have also been hurt in the process. Despite my pain, I know God wants us to stick together because that is the meaning of marriage. My total income is $600 a month, which is barely enough to survive. I earnestly hope that immigration legislation is passed and that will keep families such as mine together in the USA, the country that I consider my home.